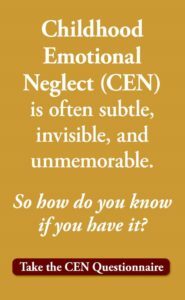 How do you cope with Childhood Emotional Neglect (CEN)? Growing up with Childhood Emotional Neglect sets you up to struggle with a series of challenges as an adult. Childhood Emotional Neglect (CEN) happens when your parents fail to respond enough to your emotions as they raise you. When you grow up this way you automatically block your feelings off as a child to cope with the implicit messages in your childhood home. With your emotions walled off, you go through your adolescence and adulthood lacking full access to a potent, vital ingredient from within: your emotions, which should be motivating, directing, connecting, stimulating, and empowering you. When you are living this way, it’s hard to see the problem, or even that there is a problem. Most children in emotionally neglectful homes have no idea that anyone should be noticing their feelings, validating them, or responding to them. Then, when they grow into adults, they continue to have no idea. Yet as an adult who grew up with Emotional Neglect, you surely may sense that something is not right with you, but you do not know what it is. Once you understand that you missed out on a key element of childhood, you are finally freed up to fix the problem. You can give yourself what you never got — emotional attention and validation — and learn how to connect with your feelings and how to use them. Childhood Emotional Neglect may leave you feeling somewhat empty and disconnected, lost or alone. But good news! There are powerful things you can do to cope. Deeply acknowledge the way Emotional Neglect happened in your family and how it’s affected you. This is not as easy as it might sound. It’s important to try to understand, for example, was it one parent or both? Did your parents fail to respond to your emotions because they were struggling themselves? Because they were selfishly focused on their own needs? Or because they simply did not know that emotions matter? Was your Emotional Neglect active or passive, mean-spirited or benign? How did it affect you as a child, and how is it affecting you now? Understanding your CEN on a deep level will free you from self-blame and shame, and validate your experience. Accept that your emotions are blocked off, but they are still there, waiting for you. Your child’s brain protected you by walling off your emotions, but it could not make them go away completely. Today you can still access them. By accepting that they exist, you’ll be able to learn how to listen to them, use them and manage them. Pay attention to your feelings. This is probably the single most powerful thing you can do to cope with your CEN. It’s a way to do the opposite of what your parents taught you, start to honor your feelings, and reach across the wall to the richness, color, and connection that lies on the other side: your emotions. Paying attention to your feelings will allow you to begin to use them as they are meant to be used. Practice sitting with negative feelings to increase your tolerance. Learning how to sit with strong or painful feelings is one of the main early building blocks to learning all of the emotion skills. Sitting with negative feelings will put you in control of yourself. Keep an ongoing list of your Likes and Dislikes. Pay attention and take special note as you go through your day. Write down everything you can find that you either do or do not like. It can be small, medium or large, but nothing is too small to make the list. Knowing these things about yourself will set you up to be able to make yourself happier. Develop and practice compassion for yourself. As a person with CEN, you are probably far kinder to others than you are to yourself. Try to accept that as a human being, you have the same rights that you allow everyone else. You will make mistakes, you will make poor decisions, and you will fail. And you should not be any harsher on yourself for those things than you would be on a friend who you love. Practicing self-compassion will build your self-love. Become aware of the feeling of anger when it happens in your body. Of all the emotions, anger is the one that, when blocked off instead of expressed and managed, will consume you. Becoming aware of your anger will immediately start to soothe and empower you. Read a book on assertiveness. Learning how to be assertive is the counterpart to becoming aware of your anger. Being assertive is a way to get other people to hear what you feel, hear and need. Learning assertiveness will make other people value you more. Share your CEN story with someone close to you. There is something about sharing your CEN story that allows you to own it and take it seriously. Telling someone about your CEN will help you feel less burdened and alone. Look for the effects of CEN on your primary relationships. Has your Childhood Emotional Neglect played out in your marriage? Affected the way you’ve parented your children? Made you feel uncomfortable with your parents? Looking for the effects of CEN in your relationships will open the door to the people you love. These 10 strategies for coping with Childhood Emotional Neglect actually do more than just help you exist and manage your life with your CEN. They have the added advantage of helping to heal your CEN. Practice these 10 strategies as best you can and you will not only survive, you will thrive. And in the most important way of all. Emotionally. To learn much more about how CEN holds you back from learning the emotion skills, how that affects your relationships, and how to heal Emotional Neglect in relationships, see the book Running On Empty No More: Transform Your Relationships With Your Partner, Your Parents & Your children. 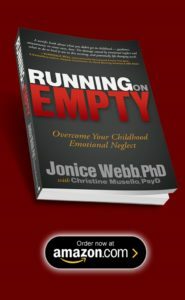 To learn much more about how CEN happens, how it plays out through adulthood, and how to heal it, see the book Running On Empty: Overcome Your Childhood Emotional Neglect. find out if you grew up with CEN, Take The CEN Test. It’s free. Dear Jami, everyone is different. I can’t answer your question very well without knowing a lot of information about you. Maybe you could see a CEN specialist to try to figure this out? I am reading your book the second time. I just feel very very tired. And terribly lonely. The hard part is that my life seems “OK” and I cannot really explain to anyone why I feel so drained. I mean I am in my early forties, healthy, well-educated, etc., so I have no “excuse” to feel bad. I didn’t have any big traumas like death or abuse. But – I live far away from all my friends, have no family of my own, no boyfriend, no job (my professional career which was giving me joy ended a year ago). I am smart and talented, and I know that in principle I could have an amazing life. It just takes SO much energy to work for it (e.g. looking for a new job) that I am spending much time in bed… feeling guilty that I do, because I know no one will “save” me, I have to pull myself together and act. I know this is CEN, and parentification, and hsp. I DO want to get out of this weight, but each time I do, it is short-lived. I live abroad and cannot afford therapy now. I do cook good food and try to be good to myself in other ways, but it isn’t enough. I am reading your book the second time. I just feel very very tired. And terribly lonely. The hard part is that my life seems “OK” and I cannot really explain to anyone why I feel so drained. I mean I am in my early forties, healthy, well-educated, etc., so I have no “excuse” to feel bad. I didn’t have any big traumas like death or abuse. But – I live far away from all my friends, have no family of my own, no boyfriend, no job (my professional career which was giving me joy ended a year ago). I am smart and talented, and I know that in principle I could have an amazing life. It just takes SO much energy to work for it (e.g. looking for a new job) that I am spending much time in bed… feeling guilty that I do, because I know no one will “save” me, I have to pull myself together and act. I know this is CEN, and parentification, and hsp. I DO want to get out of this weight, but each time I do, it is short-lived. I live abroad and cannot afford therapy now. I do cook good food and try to be good to myself, but it isn’t enough. Thank you, Dr. Webb…I came across your articles just recently after pursuing info on phobias. One thing led to another and found your articles. The CEN was exact and I was blown away. I’m not alone in this world. My story…I was adopted…I now know my birth parents who are both deceased. My adopted family…my mother did not want the adoption. Everything was fine and normal until I was about 5 years old when they told me I was adopted. Once my mother’s family was told, I was immediately rejected. I have struggled with acceptance, abandonment, rejection, shame, guilt, etc. all my life. I can pinpoint it to that event as to when it all started. My adopted parents are also deceased. I’m 71 years young and have been on a quest all my life. Recently, have gone through some losses that have triggered a lot of grief. I’ve also been dealing with anger and not knowing where it was coming from. One thing has led to another. When I think I’m over certain things, I get hit with an emotion and I’m back at square one. Finally, the other day, I was looking at myself as the one having the problem even though I didn’t know what it was. Fast forward to today, and I feel so relieved to know that CEN and HSP and BPD along with the affects of adoption are all intertwined within me. I’m not happy about it, but now I know I can work on it. I had been in therapy years ago and commented that I wanted the last half of my life to be as good as the first half had been bad. I think it is now achievable. Thank you for your research. Thank you to all those who have gone before me looking for help. It’s another stepping stone and another beginning on the journey. Life has its twists and turns…ya never know what is around the corner in your life. Keep seeking the truth. So grateful! Thank you again. Dear Pat, you have been through a lot, for sure. And you have done so much good work to overcome it. I’m impressed by your spirit and motivation to overcome your childhood. Keep it up! Me too. I am quite young, but everything makes sense now. As to why I am a complete failure when it comes to emotional support and helping others with their emotions. My parents’ behavior is revealing itself in my own behavior. Thank you for all your energy in helping to explain the previously-unexplainable to those with CEN. Having a construct, and a name even, to identify what occurred during childhood and what that might mean for adulthood has proven to be so helpful. Thank you for your books, blogs and more. Thank you. You have no idea how much this article, and your other articles, have helped me face a lifetime of feeling bad about myself. I am eternally grateful. I’m very glad to hear that Eileen! Thanks for your message. Your concept of CEN has been very useful to me, in introducing the concept and increasing my understanding of my childhood. However, even though I am absolutely certain that CEN describes my childhood, the way is has affected me is apparently completely different to the way you describe. I am absolutely not empty inside, and I absolutely do not feel walled off from my emotions. My entire life has been the complete opposite: I have always felt my emotions very strongly. Therefore I do not actually find your advice for healing useful at all. I am just telling you this in the possibility that you might want to adjust your concept of how CEN affects different people, and in case there are others who feel the same way. Dear Bettina, thanks for sharing your experience. I write about pure CEN its effects but families are complex, and so people can grow up with a variety of different experiences and effects. The thing is I don’t feel I tried as much as I can. I have 30 years, and I knew something was wrong already at the age of 8-9, but all this time I didn’t have the courage to speak it out loud. Just recently I started talking with my parents so I don’t have feeling when enough is enough. The regrets are eating me alive and I can’t resign with a fact that “there is no hope” (it’s not so easy to decide). I hope you understand. On the other side, being hopeful that they will change just keeps me in a constant worry and unsettled. Dear Filip, complicated family dynamics are very difficult to cope and live with. Please do see a therapist to help you sort this out. & Thanks for the list. 2. Your favorite books on assertiveness? Dear Scrappy, good questions! I’ll write a blog on #1. It’s too long to answer here. I like “When I Say No I Feel Guilty” by Manuel Smith. I have only one conscious memory of interacting with the 2 primary caretakers of my childhood, despite growing up in a household with a grandmother, aunts and cousins. I’m 73 and my oldest son of 2 no longer speaks to me. I neglected him after I gave birth to my second son. I would leave him, in the dark bedroom, by himself, and put the youngest one in the bed with me. He was 4 1/2 yrs. young. I know I did this, and yet, I can’t consciously reach that place of childhood emotional neglect. My parents have both passed away. My problem is with my brother, who doesn’t seem to acknowledge that my feelings are valid. How can I speak to him about it? Dear Linda, I will write a future blog about this. In the meantime, there is lots of info about CEN in families and how to talk about it in Running On Empty No More: Transform Your Relationships. It’s available in libraries and bookstores everywhere. You may find some help in it. Effects of CEN on my primary relationship – I’m so uncomfortable talking with parents. I don’t have any contact unlike my brothers who are in good relationship with them. I envy them sometimes. I feel I need parents to acknowledge me which can tremendously help me to cope with daily life challenges, anxiety, relationships etc. I know it would help me 100%. Yet the pain of lack leaves me unmotivated and without direction. Dear Filip, this is a painful situation for you to be in, for sure! 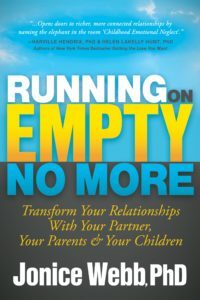 Please read Running On Empty No More: Transform Your Relationships. There is a lot of guidance in that book for your situation with your parents. It’s available in libraries and stores everywhere. Dear Filip, that is very impressive. I know it took a lot of thought and courage to approach your parents about CEN. Even though your parents have changed nothing (I’m so sorry, I know that hurts), you have gained something. You now know that you have tried as much as you could, and your parents simply do not have it to give. Their inability to change does not mean that you can’t change. You can! Please do go back to Running On Empty No More and read the last section of Chapt. 9. This is a sign that you can, and should, move on to giving yourself what you never got. All my best wishes to you!